Lake Garda is the largest lake in the whole of Italy and can be found in the north of the country. Measuring around fifty kilometres long and overshadowed by the Dolomite mountains, this has long been a popular holiday destination. People who choose to stay in a luxury camping site in this area will be able to select a bungalow tent that is set right on the edge of the water and provides enchanting views. Why Should Visitors Arrange a Camping Holiday in Lake Garda? This picturesque lake is situated between the cities of Venice and Milan and is a popular summer destination among Italians as well as travellers from all over Europe. Taking part in water sports and other outdoor pursuits are the most popular activities here, while the lake and mountain scenery also make a stunning setting for those who simply want to spend their time unwinding and exploring the area’s picturesque towns and villages. This leading LUX-camp offers enchanting lake and mountain views as well as private access to a beautiful sandy beach. The site boasts an excellent range of amenities for guests to make use of such as a sauna, tennis court and volleyball court, while a wide range of different types of evening entertainment are organised for guests. 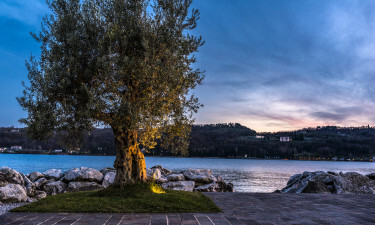 Situated right on the edge of Lake Garda, this impressive site also boasts direct access to a large strip of sand. Campers choosing to stay in a luxury tent here will also be able to make use of the outdoor swimming pool and an excellent range of other amenities. This large camping site has been designed with the needs of the modern family firmly in mind and offers an excellent range of activities for people of all ages and interests to enjoy. 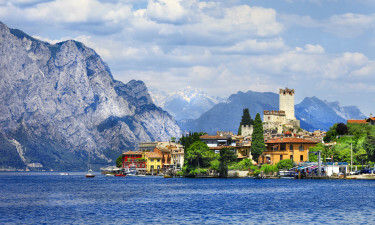 Travellers who rent a mobile home will find the shores of Lake Garda less than five miles away. Hiring a bicycle and cycling to the lake is the perfect family bonding activity. 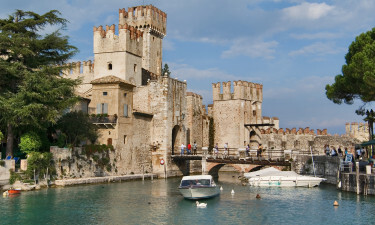 Several impressive towns can be found situated on Lake Garda and one of the most popular destinations in Sirmione, which is situated in the south of the lake. The picturesque town of Gargano is home to the villa Bettoni, which was built in the 8th century, while the town of Bardonlini boasts an impressive harbour and several enchanting paths running beside the lake to wander along. Of course, the star of the show here is Lake Garda itself and most travel to this part of Italy to spend time enjoying the water here. The south of the lake is surrounded by gently rolling hills and this is a great place for hiking and trekking, while many people travel here to climb the mighty Dolomite mountains. 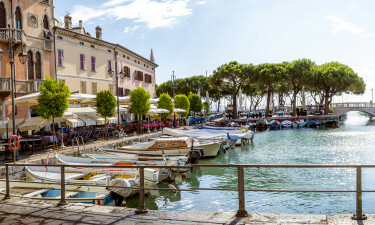 The climate at Lake Garda is particularly cool, which makes this a good place to retreat from the scorching heat of other parts of Italy in the height of the summer. Winters also tend to be mild and generally speaking there is little snow here and visitors can travel to the area to enjoy a camping holiday at any time of the year. Finding tasty things to eat in this part of the country is never a problem, as hundreds of restaurants can be found close to the water offering diners stunning lakeside views. Fresh fish dishes are particularly popular here and diners will want to sample them along with a glass or two of locally produced win.